ASUS demonstrates the Thunderbolt EX at Computex, an expansion card that plugs into a PCI Express x4 slot. The card connects to the Thunderbolt header on your motherboard and to DisplayPort, enabling users to gain access to 10Gbps data transfers with support for up to six daisy-chained devices and a seventh one in the form of a Thunderbolt/DisplayPort display. 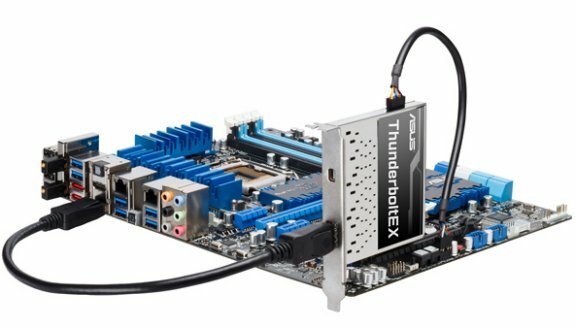 ASUS has also introduced the industry’s first Thunderbolt™ add-in card for users who have purchased selected P8Z77 or P8H77 motherboards. The ThunderboltEX* card provides an easy and flexible upgrade solution for users desiring faster data transfer speeds, thanks to its simple plug and play interface which connects to headers reserved on supporting motherboards. Users can instantly enjoy transfer speeds that are 20 times faster than USB 2.0 and 2 times faster than USB 3.0 across a wide selection of ASUS Z77 and H77 motherboards.